snowflakes are one of Earth's most exquisite wonders. The paper snowflakes we so carefully cut out and labor over each holiday do not even come close to the complexity of the real thing. Scientists continue to be fascinated by how no two snowflakes are ever exactly alike, which is part of their allure. Snowflakes, or "snow crystals" as scientists call them, are formed from water vapor that condenses directly into ice inside of the clouds. Artists are also captivated by snowflakes; studying their form and patterns. 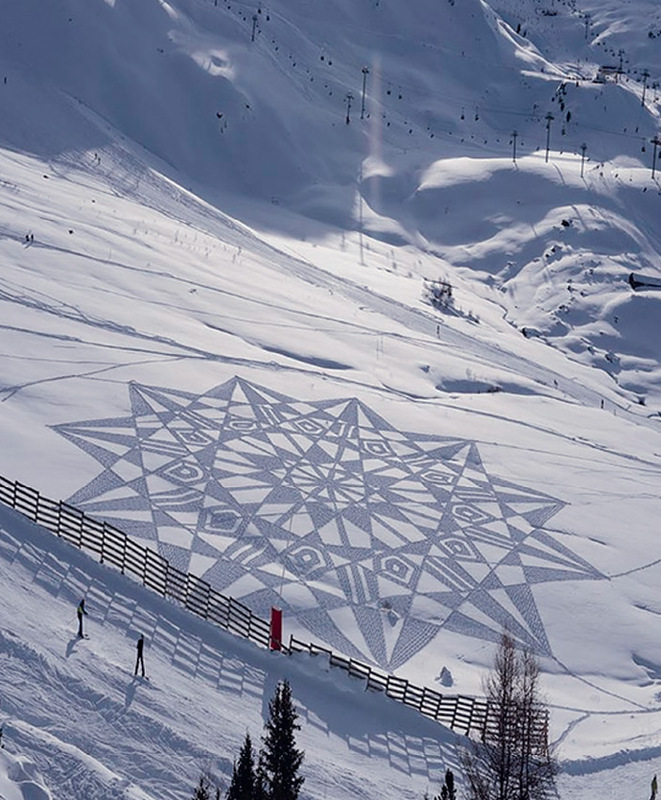 Simon Beck, snow artist, decorates the Alps with large and elaborate mathematical drawings. Every winter for the past 10 years, Beck creates snow drawings by running through the snow in very careful patterns. He spends about 10 hours a day and traveling up to 25 miles, to create the designs. The impressions end up looking something like a snowflake when viewed from far away.